How have you been doing? I'm currently working on the pillow my mother asked me to make her. I'm really happy with the color and print combination. I changed it a little!! But you can probably tell!! 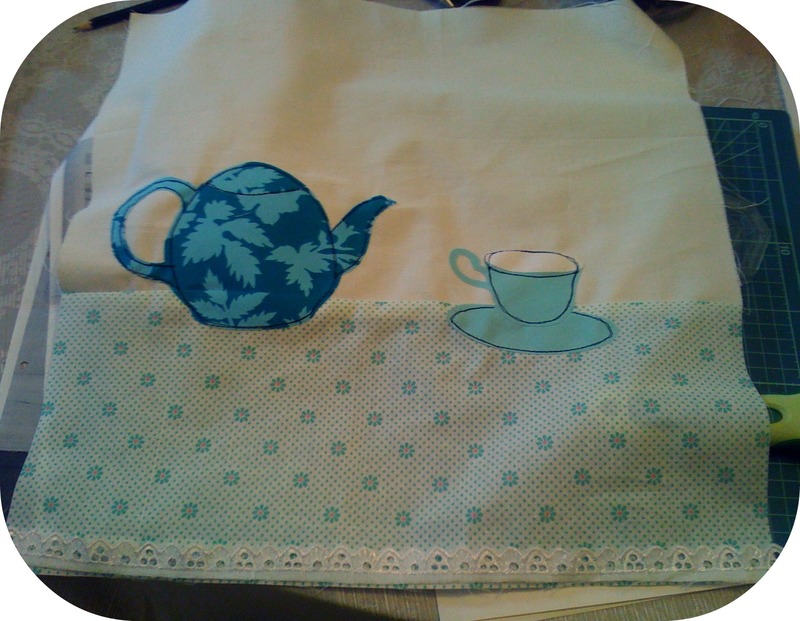 I used my own tea set, I draw it on Inkscape and voila:) I believe that I should have printed both applique pieces half an inch larger... but what can I do now?? I'm thinking of adding this lovely lace on the bottom side of the pillow as if it's a laced table cloth. I think it will be super cute. I've already cut the two back halves and I'm ready to sew it all together. Hopefully I will have it ready after work today. The problem is that all this blue/green shade keeps my mind off track!!! I cannot concentrate (Focus Daniel son Focus!!!!). Yesterday, we had a meeting at work, and decided on our summer vacations dates. So for this year I'm having a three week off starting on the beginning of July.... You probably can imagine what keeps me so distracted and slow working. 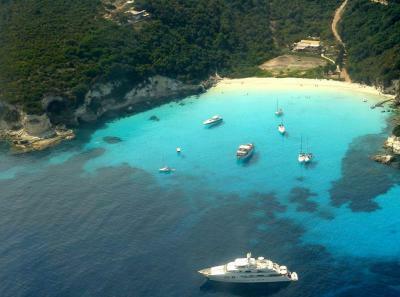 It's this... Antipaxoi island... so green... and so much blue at the same time.... never visited. Looks like heaven!!! Or perhaps this!!! Milos island!!!! Gorgeous in it's raw beauty!!! Never been there!!! MUST GO SEE!!! 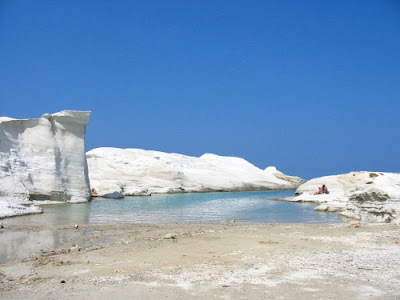 Or maybe visit again my favorite island Naxos.. It holds a special place in my heart since it's where Mr. H. and I met:) Would so want to dive again in our private pool:) It is so cold in there, but it has the most amazing bottom, so full of life!! It was the first time I saw squids and an octopus!!! Now you get my point, right?? I'm daydreaming again... and please please can someone stop me?? I have a lot to do and I refuse!!! I look at of the window... and even if it's raining cats and dogs... all I see is blue!!! p.s. Have you planned your summer vacations yet?? Eleni, STOP!!!!!! You're making me SOOOOOOOOOOO jealous, those beautiful pictures, and they're all so close to you. I love that part of the world, I lived in Cyprus for 1.5 years when I was a teenager and visited some of the Greek island, Rhodes, Athens etc. Would love to go back. We are staying in Ireland for our holidays and renting a holiday home on the beach for a week, we just have to hope and pray for good weather which is not guaranteed. p.s. - I LOVE your little teapot, that will be such a cute pillow! OK--first--I think your pot and cup are a great size. Being a wee bit small adds to the simplicity of it and its charm--and definitely keep the lace. What a nifty idea. I love the teapot!! 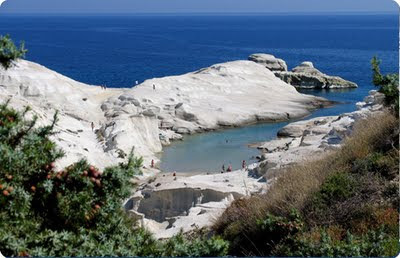 do not fret the size... OO the islands make me think of the book I was telling you of in the e-mail.... I am also in fantasy land.. thanks. sniff, sniff...teary eyed remembering my youth spent in such places...now I feel the need to plan a vacation like that to expose my kids to the beauty of the world!